Oh how beautiful is the sunshine pouring down from the sky and oh how neglected this blog has been this week. I mean, we had conference and I have yet to blog about it... SHESH! I need to get with the program. Conference was fantastic. Incredibly extremely entirely fantastic. I took an entire 60 pages of notes. Yes you read that right....60 PAGES! Granted, I write really BIG and I also draw a lot of pictures that take up space, but still, this should count for some kind of record. Feel free to send me any awards. This conference brought so much peace and direction into my life just when I needed it the most. This conference weekend has reaffirmed my desire to serve a mission in a year and a half. I love this gospel with all my heart and I can honestly say that if the prophet called me up and asked me to leave tomorrow I would go without giving it a second thought. I don't know how I'm going to survive the year and half wait, but I think my mom is glad the wait is there. Oh how I desire to obtain a name tag. Thanks to this reaffirmed desire, I have spent much of my free time pouring over missionary blogs, pinning missionary things on pinterest, and scrolling through the comments on this facebook page for sisters who are preparing to serve missions. Which is probably why this blog has remained untouched. So since I am not able to leave on a mission right now I think I'll make this quote my new goal. Whose with me? So you watched conference... now what? The end of conference is a time to change. It is a time to re-evaluate your life and to see the areas where you could become better. Its a time to listen to the Lord speak through the voice of prophets. The words spoken in conference are true and if we follow what they say we will become better and we will become more like Christ. Although it may be "day six" when it comes to conference (thanks to my lack of blogging) we still have time to take action. 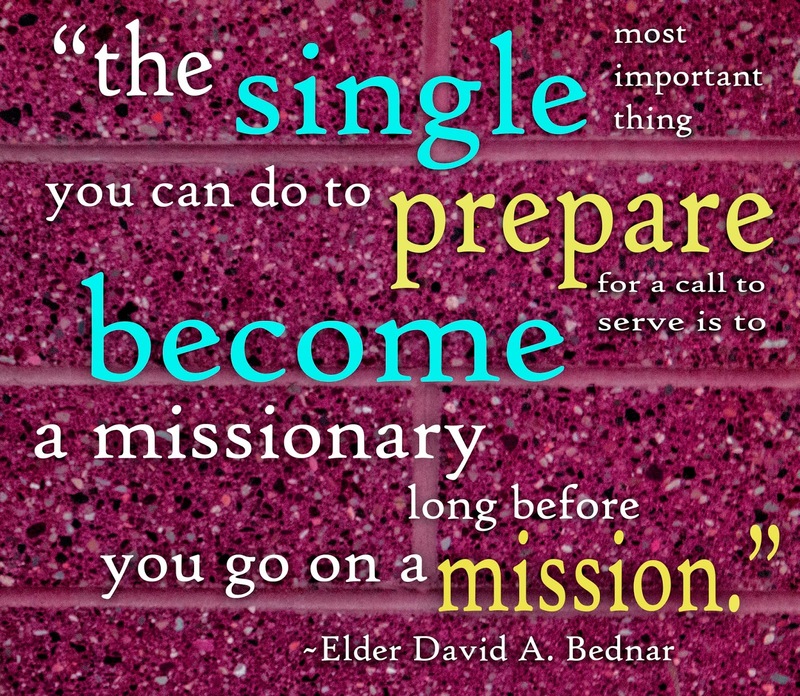 For me it is becoming a better missionary. I know that if we follow the words of the prophets and we apply what they say into out lives that we will notice a change in ourselves. I have a testimony of this gospel and I believe it to be true with all my heart. I found so much joy in conference and I can't wait to take action. p.s. for those of you who missed conference you can watch it HERE! p.s.s. GUYS!! My bangs are finally long enough to fit into a ponytail without being braided! You are so awesome! I know you will be a fantastic missionary! I love what you said about applying conference and being a missionary now, too. That is so important. I really want to be better at that this year.